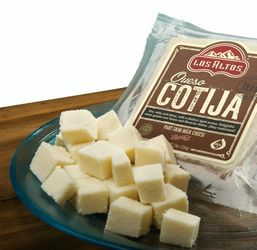 Queso Cotija Cheese is a very traditional Mexican cheese, Los Altos Queso Cotija is a low moisture, firm, and aged cheese. It�s salty, strong in flavor and distinctively sharp. It�s simply delightful when grated over beans and great to use on recipes that need that added complexity of salt and cultured butter. El Queso Cotija A�ejo tiene un exquisito sabor ideal para espolvorear en sus platillos Mexicanos. Es conocido como el queso parmesano de Mexico, delicioso con pastas, sopes, quesadillas, enchiladas y con los frijoles. This is just the right cheese for a chicken burrito. It is a block of cheese that grates easily, is salty with a dry texture and just the right amount of umami, not too much. Kind of like parmesan, but milder. If you are making overstuffed burritos, you need it. I actually sent this to my son. He has moved to Florida and can't find it anywhere. I ordered it for a birthday joke gift. It arrived cool in great condition. He was ecstatic!! By far the best taste and quality he's had. By chance only they were having fajitas for dinner so the timing was perfect. I've talked to a gentleman at the company. He was so kind and helpful. Not easy due to the fact I speak with an electronic device due to cancer. So the staff and the product were absolutely top of the line. This is a great Cotija because it's not overly salty, and very flavorful, It's so good that I can eat it by itself. Cotija is full of flavor. You can grate it or crumble it like I do on refried beans or enchiladas. This Cotija is firm so you can cube it too. It's a very traditional Mexican cheese, and you can use it instead of salt to add flavor to any dish you like.